The gross domestic product, or GDP, is the broadest measure of a nation’s economy. But since the Great Recession ended in 2010, the U.S. GDP has only grown between 1.6 percent and 2.6 percent on an annual basis. To help spur this boom in the U.S. economy, Trump is pressing to overhaul the U.S tax code by cutting tax rates and eliminating complex tax rules. When he talks about his tax plan, that’s when the president enviously highlights the GDP growth of other countries. On several occasions, Trump anonymously quoted heads of state who he claims are unsatisfied with GDP growth of 7-to-9 percent –more than five times the United States’ 2016 rate of 1.6 percent. Trump certainly speaks with foreign leaders on a regular basis, but very few countries have 7-to-9 percent GDP growth. We wanted to know: Who could he be quoting? Let’s check the records. On July 25, Trump sat down with the Wall Street Journal’s editor-in-chief Gerard Baker. During the interview, according to an unedited transcript obtained by Politico, Baker asked Trump what he thought was a reasonable corporate tax rate. Trump responded that he was “asking for 15 percent,” before recounting an exchange about GDP growth he’s had with several leaders of “major – major countries.” Trump claims that these unnamed heads of state lament GDP growth of 9 percent while the United States sees only “1 percent” growth each year. On Sept. 6, during a speech in North Dakota outlining the need for a new tax plan, Trump repeated the claim, almost verbatim, adding that he spoke “recently” with two leaders who were unhappy to report 7 and 9 percent GDP growth. In both cases, Trump did not name the foreign leaders. During his interview with the WSJ, he did mention Malaysia, Indonesia and China as countries with large populations and high growth. In 2016, Malaysia, (population 30.1 million) saw a 4.2 percent increase in GDP, according to the World Bank. Indonesia’s GDP grew 5 percent in 2016. And China’s GDP increased 6.7 percent. We pored through the White House Press Office’s log of the foreign leaders Trump has met with, or spoken to since taking office. Trump has spoken to 58 heads of state between Sept. 9 and Jan. 28, according to the White House records. Of these 58 countries only three had a 2016 GDP growth rate of roughly 7 percent or more: Iraq, India and the Philippines. Could the mystery callers be Philippines President Rodrigo Duterte, Indian Prime Minister Narendra Modi, or Iraqi Prime Minister Haider al-Abadi? – On April 4, Trump spoke with Duterte over the phone. – On July 11, Trump spoke with al-Abadi over the phone. – On Aug. 18, Trump spoke with Modi over the phone. On June 26, Modi visited Trump at the White House. In 2016, the Philippines’ GDP grew by 6.9 percent, India saw a 7.1 percent increase, and Iraq had the largest increase of 11 percent. When Trump sat down with the WSJ in July, he had already spoken with all three leaders. While all of the countries have a GDP growth rate well above the United States, none can claim a 9 percent increase. This fact leaves us scratching our heads, and wondering, who is the president quoting? At best, Trump is mis-remembering the conversations, and at worst, he is making up the facts. The White House did not respond to repeated requests for information. By September, Trump changed his claim slightly to include a leader who was unhappy to report 7 percent GDP growth. Several signs point to India’s prime minister as that unhappy head of state. First, India’s population is 1.3 billion, which qualifies the country as “big big.” Second, Modi and Trump spoke last in August, and Trump described the call as recent. Third, Trump and Modi share a similar “my-country-first” economic agenda. When Modi visited the White House on June 26, Trump praised Modi for making the largest tax cut in India’s history. Here’s the catch: comparing the United States economic growth to India’s is like comparing apples to oranges. India is an emerging economy. An emerging economy is defined by rapid economic growth due to technological improvements, growing workforces, major capital investments, and changes in political and social practices. These countries are not as wealthy as the United States or Canada, but are trying to catch up. India’s emerging economy explains why India’s GDP percentage growth tops the United States’ year after year. Douglas Holtz-Eakin, president of the American Action Forum, a right-leaning policy organization, says it is much harder to make rapid economic gains in countries that have already experience a period of major investment. Instead, countries like the United States “are doing the hard work of keeping the economy churning along,” said Holtz-Eakin, a former director of the Congressional Budget Office. Jared Bernstein, senior fellow at the Center on Budget Policy Priorities, a left-leaning research and policy institute, shares Holtz-Eakin’s analysis. Bernstein adds that Trump’s assertion that the United States can match India by issuing major tax cuts is “nonsensical.” Bernstein attributes India’s growth to several factors, including a younger and growing labor force. In contrast, the United States has a shrinking and aging labor force. “As long as I’ve been looking at the numbers, China and India have always grown faster than the U.S.,” said Bernstein, an economic adviser to Vice President Biden during the Obama administration. “They are more volatile. They might fall faster as well,” he said. Since meeting with Trump, Modi learned that India has hit an economic rough-patch. From April to June, India’s growth slumped to 5.7, the lowest in three years, according to numbers released in September. Economists point to a decline in manufacturing growth, a sector Modi pledged to revitalize, as a key cause for the slump. Manufacturing growth bottomed out at 1.2 percent, from 10.7 percent during the same period a year ago. By a process of elimination, it is possible the prime minister of India is the world leader who is unhappy with 7 percent growth rate. (He’s probably even unhappier now that growth appears to be slowing.) Certainly, Trump has expressed interest in rivaling India’s growth. That’s one world leader. But the world leader who Trump claims is unhappy with 9 percent growth appears to be a phantom. Of the 58 heads of state he’s met or spoke with since taking office, not one can claim 9 percent GDP growth. Perhaps Trump misheard. Or perhaps the other leader was fibbing. Or maybe Trump just thought the pitch for a tax cut sounded better if he could quote two leaders. In any case, Trump is making a major economic error in comparing the GDP of a developed country to a developing one. 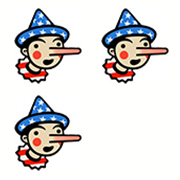 For his half-truths, and for comparing apples to oranges, Trump receives Three Pinocchios. "When I talk to the leaders of other countries – I speak to them all the time - they’re unhappy about 7 or 8 points of growth - GDP"
During a speech on tax reform in Bismarck, North Dakota.